Planetary Herbals Herbals/Herbal Extracts - Triphala Laxative 690 mg -. Use Triphala Laxative&trade; 690 mg 120 Capsules from Planetary Herbals and help your body clear impurities effectively. 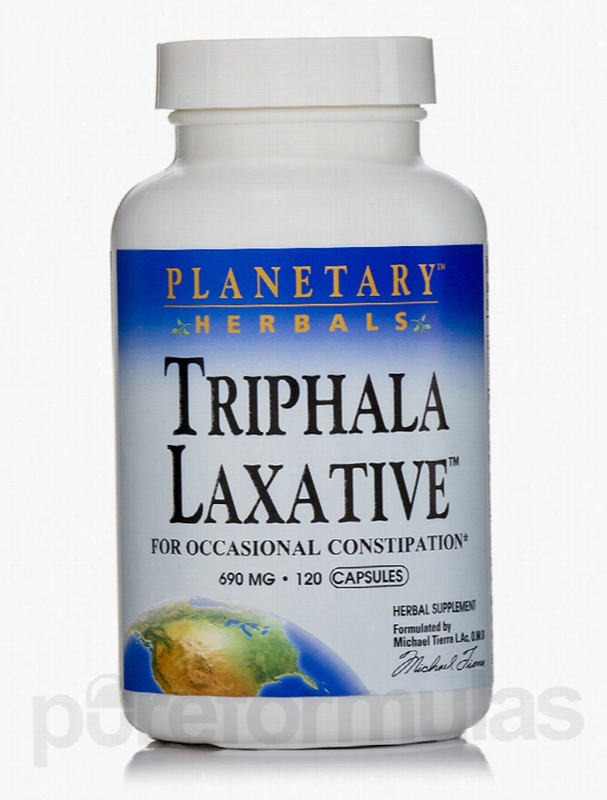 Ancient ayurvedic medicine uses Triphala laxative - a three fruit combination to clear an occasional constipation. Bad and irregular food habits are accompanied by problems related to constipation. This Planetary Herbal supplement may well be your answer to better digestive health. Triphala means a combination of three fruits&sbquo; Amla&sbquo; Behada and Harada. These three fruits work with each other and help in proper assimilation of food and also cleansing. Triphala has been used in India for centuries for better digestive health along with strengthening and toning of the digestive system. It is also said that this Planetary Herbals supplement does not cause dependency. Amla is a rich source of Vitamin C while Behada may act as a gentle purgative. The Harada fruit contains tannins&sbquo; lignans along with flavonoids that are antioxidant rich. This Planetary Herbals formula works effectively for better elimination along with colon cleansing and strengthening the GI tract. The goodness of western herbalism is also included in this Planetary Herbals capsules. Marshmallow and licorice root extracts increase the growth of intestinal mucosa and reduces irritation in the intestines. Ginger and artichoke are believed to increase the health of your digestive system. Cyperus may be an effect help in preventing stomach cramps. The components like the buckthorn&sbquo; rhubarb and cascara may help in elimination. Get the goodness of Triphala Laxative&trade; 690 mg 120 Capsules from Planetary Herbals for holistic and balanced approach for occasional constipation. These statements have not been evaluated by the Food and Drug Administration (FDA). These products are not meant to diagnoseÃ¢ÂÂ treat or cure any disease or medical condition. Please consult your doctor before starting any exercise or Nutritional supplement program or before using these or any product during pregnancy or if you have a serious medical condition. 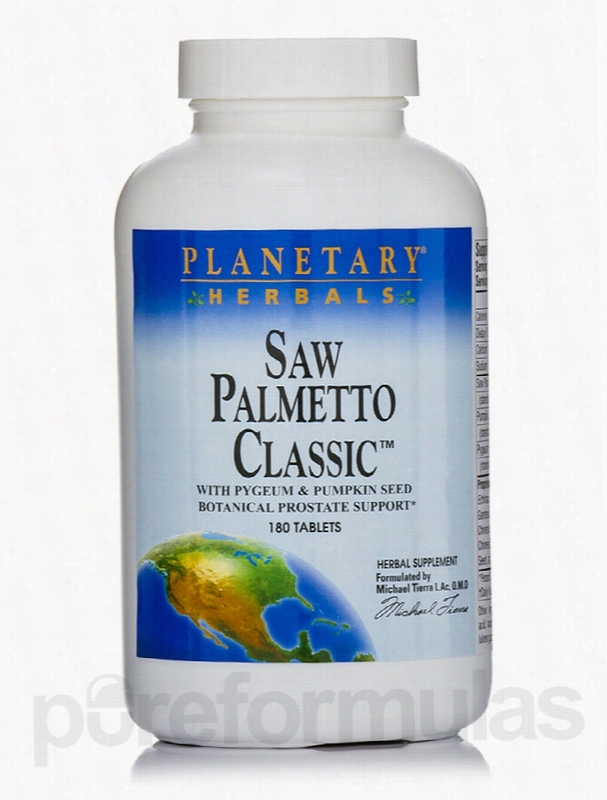 Planetary Herbals Herbals/Herbal Extracts - Saw Palmetto Classic - 180. The comprehensive formula Saw Palmetto Classic&trade; 180 Tablets from Planetary Herbals is your answer to better prostate health. This robust supplement contains a blend of other botanicals that together support the functions of the prostate gland. Saw Palmetto (Serenoa repens) has been used by Native Americans in their diets for a long time now. Rich in sterols and fatty acids&sbquo; these berries are said to work towards prostate health. Age and environmental stress are the main reasons for the depreciation in the health of the prostate gland. Prostate is a walnut-sized gland below the bladder in men. As age advances&sbquo; it may swell up and in certain cases make urination very difficult. Bad food habits too may contribute to the decrease in prostate health. This is where a good saw palmetto supplement&sbquo; such as this one from Planetary Herbals&sbquo; may be effective. As men age&sbquo; the male hormone testosterone rapidly converts to estrogen and the prostate cells are sensitive to the growth stimulatory effects of estrogen. Testosterone may also be converted to DHT dihydrotestosterone. Saw Palmetto supplements from Planetary Herbals may prevent the conversion and may further accelerate the elimination of DHT from the prostate tissues. The other components used in this Planetary Herbals extract are pumpkin seeds oil extract and pygeum bark extracts. The pumpkin seed oil is rich in zinc&sbquo; which studies believe normalizes prostate functions. Tradition believes that the pygeum bark extracts contain compounds that help prostate functions too. 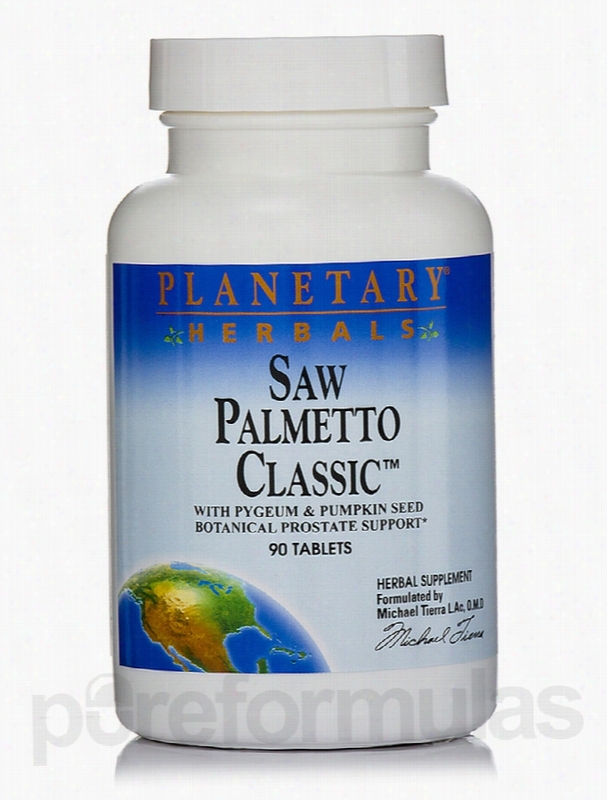 Maintain a good prostate health with Saw Palmetto Classic&trade; 180 Tablets from Planetary Herbals. These statements have not been evaluated by the Food and Drug Administration (FDA). These products are not meant to diagnoseÃ¢ÂÂ treat or cure any disease or medical condition. Please consult your doctor before starting any exercise or nutritional supplement program or before using these or any product during pregnancy or if you have a serious medical condition. Planetary Herbals Herbals/Herbal Extracts - Cranberry Bladder Defense. Cranberry Bladder Defense&trade; 880 mg 120 Tablets from Planetary Herbals may provide antioxidant support to the cells while maintaining the health of the urinary tract. Cranberries are usually popular during fall and people associate them with the Thanksgiving or Christmas feasts where they are served as a sauce. But this bright red&sbquo; tart-tasting fruit has medicinal properties that have been overlooked for ages. Medical research and the study of old traditions have shown that Native Americans knew about the fruit&rsquo;s medicinal value. 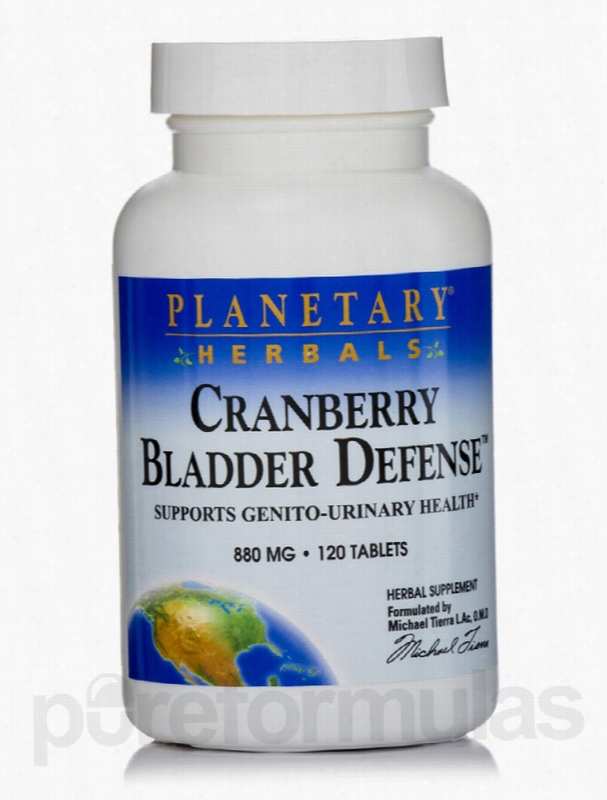 Planetary Herbals has used this ancient knowledge and modern findings to create a very efficient supplement called Cranberry Bladder Defense&trade; 880 mg 120 Tablets. It was in the 1880s that German physicians recognized the benefits of cranberries and understood its cleansing properties. Cranberries contain anthocyanins&sbquo; flavonoids that provide the fruit with its bright color. Anthocyanins are powerful antioxidants that might fight the activity of free radicals to prevent cell damage. The cranberry extract used in the supplement from Planetary Herbals might also be able to reduce the pH of the urinary tract&sbquo; which in turn might support bladder health. Combined with echinacea and purple cone flower to improve natural defenses&sbquo; Cranberry Bladder Defense&trade; 880 mg 120 Tablets from Planetary Herbals also contains uva ursi&sbquo; which is known for its ability to support the health of the urinary tract. These statements have not been evaluated by the Food and Drug Administration (FDA). These products are not meant to diagnoseÃ¢ÂÂ treat or cure any disease or medical condition. Please consult your doctor before starting any exercise or Nutritional supplement program or before using these or any product during pregnancy or if you have a serious medical condition. Planetary Herbals Herbals/Herbal Extracts - Myelin Sheath Support 820. Myelin Sheath Support 820 mg Tablets from Planetary Herbals might support the fat-like insulating sheath that surrounds the nerve tissues. This protective sheath is called myelin and is made up of protein and fatty substances. Myelin is found around nerves&sbquo; including those in the brain and spinal cord. The myelin allows electrical impulses to transmit quickly and efficiently along the nerve cells and any damage to the myelin sheath can slow down this transmission. Myelin Sheath Support 820 mg Tablets from Planetary Herbals combines Ayurvedic and Chinese herbal components with some Vitamins and minerals that work together to support the nervous system. One of the key components in this supplement is vitamin B-12&sbquo; which is necessary for maintaining the circulatory system and the synthesis of proteins. This supplement from Planetary Herbals contains herbs like ashwagandha&sbquo; bacopa&sbquo; and guggul&sbquo; which are all part of traditional herbal practices. Ashwagandha is considered a health tonic&sbquo; while bacopa might promote mental efficiency. Myelin Sheath Support 820 mg Tablets from Planetary Herbals also contains tienchi ginseng that might have anti-stress properties and could aid in enhancing immune defenses. These statements have not been evaluated by the Food and Drug Administration (FDA). These products are not meant to diagnoseÃ¢ÂÂ treat or cure any disease or medical condition. Please consult your doctor before starting any exercise or nutritional supplement program or before using these or any product during pregnancy or if you have a serious medical condition. Planetary Herbals Herbals/Herbal Extracts - Bacopa-Ginkgo Brain. 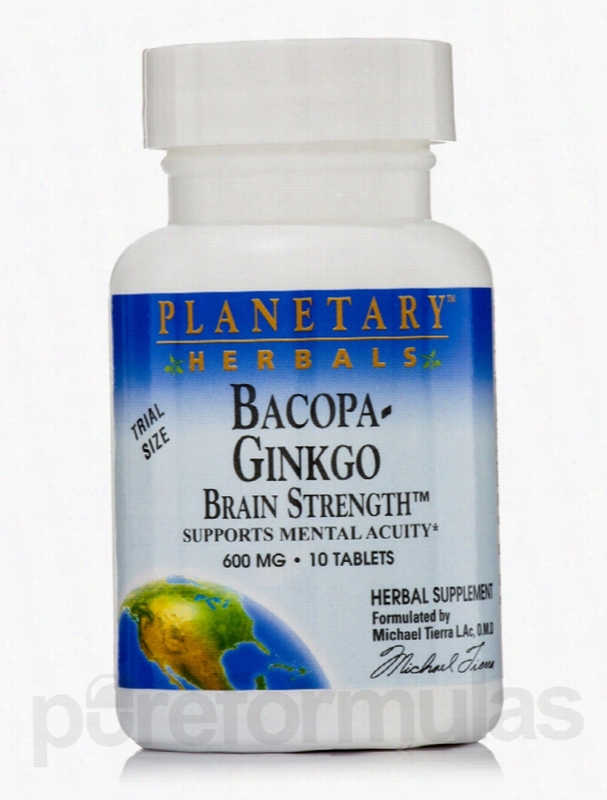 Bacopa-Ginkgo Brain Strength&trade; 600 mg 10 Tablets from Planetary Herbals might support and maintain your brain&rsquo;s peak functioning. We cannot function properly if our brain slows down and a quick brain is necessary to stay abreast with this fast-paced world. This supplement from Planetary Herbals brings together the best of the two worlds: Ayurvedic medicine and Chinese herbalism. Ayurveda follows the principle that it is important to maintain a balanced mind and body&sbquo; to perform efficiently. At certain times&sbquo; our brain needs to be more alert and it is such situations that can be handled with this supplement from Planetary Herbals. Bacopa-Ginkgo Brain Strength&trade; 600 mg 10 Tablets from Planetary Herbals brings to you a compound that contains the duo of bacopa and gingko that could help improve your cognitive power. The herb Bacopa monniera is also called Brahmi and has been used in Ayurvedic medicine to support the efficient functioning of the brain&sbquo; especially memory retention. Studies have shown that bacopa might aid the brain to process information faster and increase learning. The Chinese ingredient in this supplement from Planetary Herbals is ginkgo biloba&sbquo; which has been shown to improve the circulation of oxygen and glucose that fuel the brain. The improved circulation in turn improves the functioning of the brain. Bacopa-Ginkgo Brain Strength&trade; 600 mg 10 Tablets from Planetary Herbals also contain cardamom&sbquo; ashwagandha root&sbquo; and Indian valerian root&sbquo; which are called adaptogens that help the body adapt to stress. These statements have not been evaluated by the Food and Drug Administration (FDA). These products are not meant to diagnoseÃ¢ÂÂ treat or cure any disease or medical condition. Please consult your doctor before starting any exercise or nutritional supplement program or before using these or any product during pregnancy or if you have a serious medical condition. 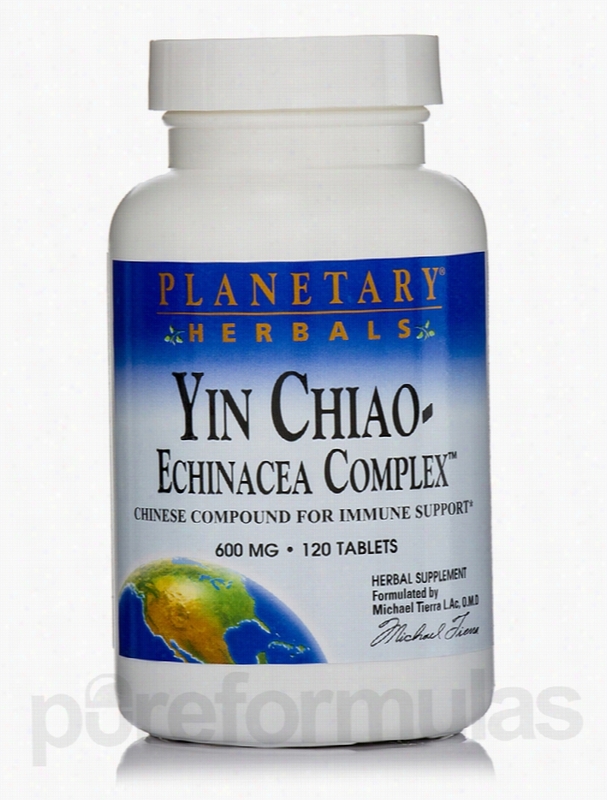 Planetary Herbals Herbals/Herbal Extracts - Yin Chiao-Echinacea. Seasonal changes are sure to bring with it a host of diseases and Yin Chiao-Echinacea Complex&trade; 600 mg 120 Tablets from Planetary Herbals may well be your solution. Change in seasons requires rest but this fast-paced world may leave no time for relaxation. This may in turn wreck havoc on our physical well-being and Immune health. This Chinese herbal formula&sbquo; Yin Chiao&sbquo; believes in reducing imbalances caused in the body due to seasonal changes. Chinese herbalists and acupuncturists have long believed in the goodness of this herb. This Planetary Herbals supplement brings to you this time-tested formula in easy to swallow tablets. Echinacea is well-known in European lands as an age-old formula to treat upper respiratory tract conditions. It is believed that the entire Echinacea plant; the flowers&sbquo; leaves and roots contain helpful value. It is believed that Echinacea extracts strengthen the body&rsquo;s defense mechanisms and may well keep infections at bay. There are some people who believe that Echinacea extracts when taken during a cold may reduce the intensity of a cold. This supplement combines various other herbs such as the honeysuckle flower&sbquo; Chinese mint leaf&sbquo; burdock seed&sbquo; forsythia fruit and more. These herbs come together in this powerful potent from Planetary Herbals to give you the immune-boosting you require during seasonal changes. The dietary supplement Yin Chiao-Echinacea Complex&trade; 600 mg 120 Tablets from Planetary Herbals contains calcium that may be vital for maintaining good bone&sbquo; hair and nail health. These statements have not been evaluated by the Food and Drug Administration (FDA). These products are not meant to diagnoseÃ¢ÂÂ treat or cure any disease or medical condition. Please consult your doctor before starting any exercise or nutritional supplement program or before using these or any product during pregnancy or if you have a serious medical condition. Planetary Herbals Herbals/Herbal Extracts - Reishi Mushroom Supreme. Reishi Mushroom Supreme&trade; 650 mg 100 Tablets Reishi Mushroom Supreme&trade; 650 mg 100 Tablets from Planetary Herbals may help support and maintain your immune defenses. The Health of our immune system is the key to our overall wellbeing and it is thus important to keep our immune defenses strong. It may also be beneficial to support it with the help of supplements like this one from Planetary Herbals. The reishi mushroom or Ganoderma lucidum is also known as Ling Zhi in China and grows wild on decaying logs and tree stumps. The reishi mushroom might have the ability to support the immune system while possibly promoting calmness and mental wellbeing. The supplement uses a concentrated extract of the mature fruit with the mycelia biomass. 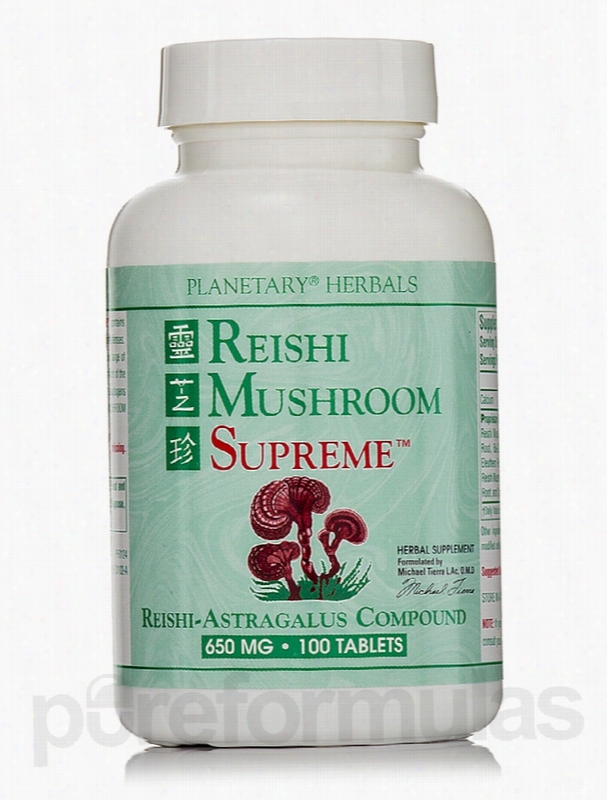 Reishi Mushroom Supreme&trade; 650 mg 100 Tablets from Planetary Herbals combines the potentially beneficial properties of the reishi mushroom with other potent herbs and brings it to you in the form of easy to take tablets. Other ingredients used include shiitake mushrooms&sbquo; schisandra fruit&sbquo; and astragalus root. Shiitake mushrooms could boost the immune system and more. Schisandra falls under the category of herbs called adaptogens&sbquo; which help the body adapt to stress. It has been shown to improve mental and physical endurance&sbquo; while astragalus root might improve immune functioning. Reishi Mushroom Supreme&trade; 650 mg 100 Tablets from Planetary Herbals also has calcium to help you maintain good bone&sbquo; hair&sbquo; and nail health. These statements have not been evaluated by the Food and Drug Administration (FDA). These products are not meant to diagnoseÃ¢ÂÂ treat or cure any disease or medical condition. Please consult your doctor before starting any exercise or nutritional supplement program or before using these or any product during pregnancy or if you have a serious medical condition. Planetary Herbals Herbals/Herbal Extracts - St. John's Wort Emotional. 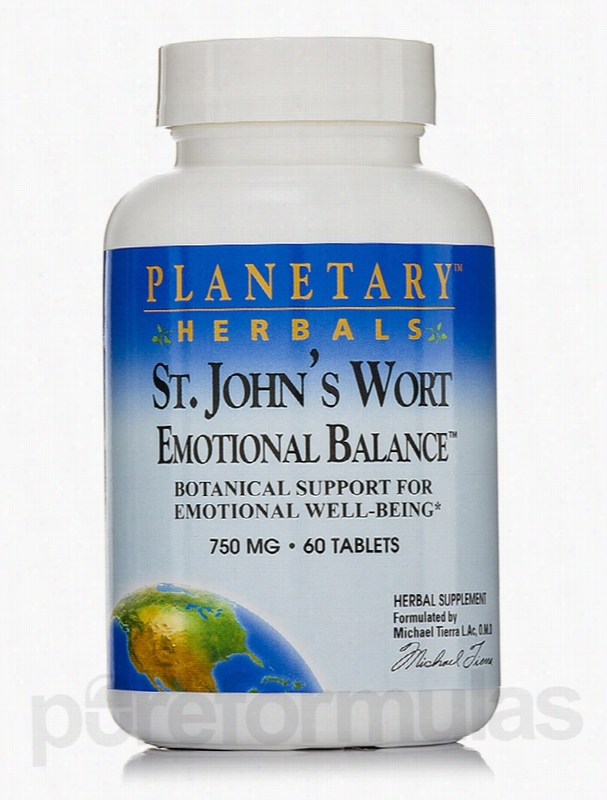 Planetary Herbals brings you St. John's Wort Emotional Balance&trade; 750 mg 60 Tablets that helps support better mental balance and provides a positive outlook to life. St. John&rsquo;s Wort has been used for over centuries to help with emotional well-being. Hypericum perforatum&sbquo; St. John&rsquo;s Wort is a native to Europe and is acclaimed for its medicinal properties. Modern life brings with it stress and tension and the drive to achieve better and faster may sometimes drain us of our emotional strength. This is why we may need a supplement such as this one from Planetary Herbals to help us. This Planetary Herbals supplement also combines the strength of the Chinese classical formula&sbquo; Xiao Yao Wan. This herb is believed to support a positive and stable emotional health. The substance hyperforin present in this supplement may have antibacterial and anti-inflammatory effects that may help with the state of well-being. These tablets from Planetary Herbals also contains the Bai-Zhu Atractylodes Rhizome that ensure the well-being of the liver and fights oxidation and stress. This rhizome is also known for its properties of regulating the blood-sugar levels and its ability to adjust gastrointestinal motility. The other ingredients of this supplement are Jujube seeds&sbquo; Bupleurum Root&sbquo; Tree Peony Root Bark&sbquo; Dong Quai Root&sbquo; Poria Sclerotium&sbquo; Lemon Balm Leaf&sbquo; Cyperus Rhizome&sbquo; Licorice Root&sbquo; and Ginger Root. All these herbs play their part in supporting and helping emotional well-being. Use St. John's Wort Emotional Balance&trade; 750 mg 60 Tablets from Planetary Herbals and say hello to a better life. These statements have not been evaluated by the Food and Drug Administration (FDA). These products are not meant to diagnoseÃ¢ÂÂ treat or cure any disease or medical condition. Please consult your doctor before starting any exercise or nutritional supplement program or before using these or any product during pregnancy or if you have a serious medical condition. Planetary Herbals Herbals/Herbal Extracts - Saw Palmetto Classic - 90. Saw Palmetto Classic&trade; Tablets from Planetary Herbals may potentially assist with areas of prostate health. These helpful benefits are now available in the convenience of a tablet. Saw Palmetto (Serenoa repens) berries are often harvested for health. These berries are believed to be rich in sterols and fatty acids that may work towards better prostate health. The advent of age sets the male hormone testosterone to rapidly convert to estrogen. The testosterone may also convert to DHT dihydrotestosterone. The cells of the prostate glands are sensitive to the stimulatory effects of estrogen. Saw Palmetto supplements from Planetary Herbals may potentially prevent estrogen conversion as well as help in the acceleration of the elimination of DHT from the prostate tissues. The other components used in this Planetary Herbals extract are pumpkin seed oil extract and pygeum bark extracts. The pumpkin seed oil is rich in zinc&sbquo; which is believed to normalize prostate functions. It is believed that the pygeum bark extracts contain compounds that help prostate functions too. Support potential improvements to prostate health with the Saw Palmetto Classic&trade; 90 Tablets from Planetary Herbals. These statements have not been evaluated by the Food and Drug Administration (FDA). These Products are not meant to diagnoseÃ¢ÂÂ treat or cure any disease or medical condition. Please consult your doctor before starting any exercise or nutritional supplement program or before using these or any product during pregnancy or if you have a serious medical condition. Planetary Herbals Herbals/Herbal Extracts - Full Spectrum Lomatium. Full Spectrum&trade; Lomatium Alcohol Free Glycerite Liquid 4 fl. oz (118.28 ml) from Planetary Herbals may help combat upper respiratory infections and also provide robust Immune system support. Lomatium generally refers to Lomatium dissectum&sbquo; which is a native to North America and grows in rocky soil. For centuries&sbquo; the Native Americans believed that this plant had medicinal properties and was also considered a food source. The roots of this plant are washed and dried. It is believed that when the roots are dried in correct conditions it may retain its medicinal properties for longer. Lomatium contains tetronic acid and glucoside&sbquo; which are believed to support immune health. This botanical is also said to provide antimicrobial&sbquo; antifungal and anti-inflammatory effect. 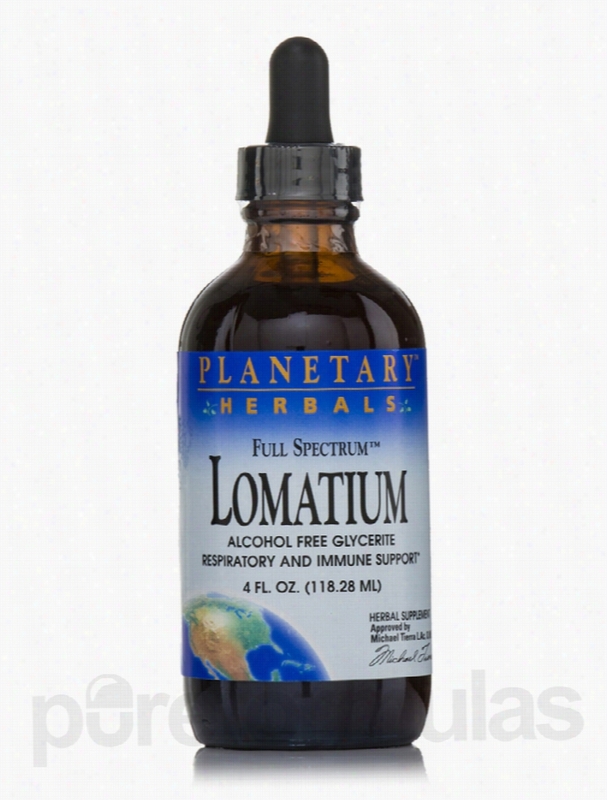 This Lomatium glycerite extract from Planetary Herbals is produced in a way that the goodness of Lomatium is utilized completely into alcohol. The alcohol is then evaporated. Naturally sweet glycerin is added to make this Planetary Herbals supplement a hit with kids too. Primarily used for upper respiratory infections&sbquo; naturopathic physicians and herbalists are now said to utilize the extracts of the Lomatium plant to help with the most difficult of viral diseases. Get your dose of Full Spectrum&trade; Lomatium Alcohol Free Glycerite Liquid 4 fl. oz (118.28 ml) from Planetary Herbals for helping with upper respiratory infections. These statements have not been evaluated by the Food and Drug Administration (FDA). These products are not meant to diagnoseÃ¢ÂÂ treat or cure any disease or medical condition. Please consult your doctor before starting any exercise or nutritional supplement program or before using these or any product during pregnancy or if you have a serious medical condition.